Romelu Lukaku and Nemanja Matic, the only two players to escape criticism from manager Jose Mourinho this week, scored the goals that carried Manchester United through to the FA Cup semi-finals with a 2-0 win over Brighton at Old Trafford. Lukaku struck after 37 minutes although his 25th goal of the season owed everything to the delivery by team-mate Matic who sent over a far-post cross which hung invitingly for the Belgian international. As he has so often this season, Lukaku powered past his marker Lewis Dunk before forcing the ball in with a header from almost point-blank range. 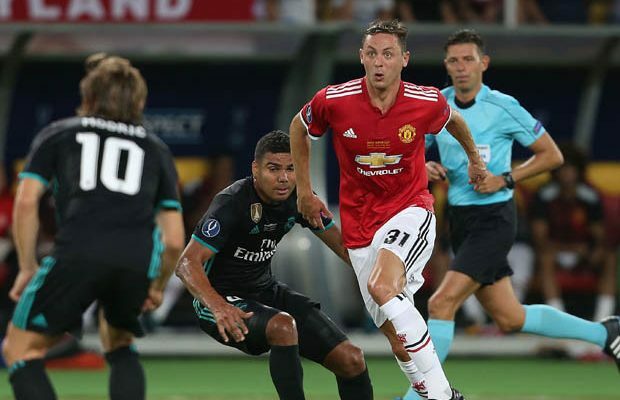 And seven minutes from time, Matic rose in convincing fashion to meet Ashley Young’s pinpoint free-kick and head in a goal that finally killed off a strong second-half showing from the visitors. Mourinho had used his pre-match press conference on Friday to launch an impassioned defence of his reign as United manager, in which he had hinted broadly that a number of his players had not been performing consistently this season - with only Lukaku and Matic singled out for praise. Coincidentally or not, the United manager left two of his biggest signings, Paul Pogba and Alexis Sanchez, out of his starting line-up despite the FA Cup being his club’s only hope of silverware this season following the disappointing midweek loss to Sevilla in the Champions League. A flurry of snow before kick-off made sure the game kicked off in difficult conditions, and it was the half-hour mark before Brighton’s defence was remotely troubled when Juan Mata played a series of sharp passes with Anthony Martial to open up a shooting opportunity which was deflected behind for a corner. Mata took the set-piece himself, which ended with Tim Krul turning Chris Smalling’s shot against the post. Brighton missed a rare chance before the break when Pascal Gross’s corner picked out Dunk, who had lost his marker Scott McTominay, and his powerful effort was well saved by Sergio Romero. However, the visitors started the second half in far more ambitious mode with Gross appearing in dangerous positions to, first, shoot just wide and then see an effort blocked. Jurgen Locadia then forced Romero into a fine save high to his right. Albion were building momentum and should have been level when Locadia headed wastefully wide when unmarked at the back post. That miss was proved costly as United’s efficiency showed when Matic headed home their second goal from just their second shot on target all night.